I’ve only been to one of the three Cup and Saucer restaurants in Portland, the Hawthorne location. Needless to say, for not only a Portland weekend but for one on busy Hawthorne, there is a wait for breakfast and brunch on the weekends. Fortunately service is quick and the coffee and water keep coming once you do sit down. The vegan options at Cup and Saucer include tofu scrambles, homefries, coffeecake and corncakes (which can be made with blueberries). Vegan-friendly items are marked on the menu as well. They also serve local treat K & F coffee, and not Stumptown for those of you seeking a change of caffeinated pace. 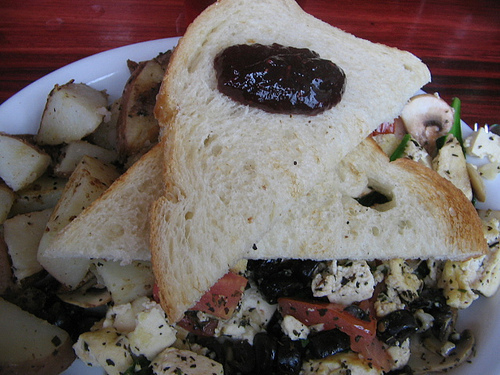 On Saturday I ordered the tofu scramble of the day, the “Italian scramble”. It consisted of firm tofu, garlic, basil, tomatoes, mushrooms, olives and spinach and was by far the best meal I’ve yet to have there. The potatoes were somewhat undercooked, but even that I’d look past. I was so pleased with this meal. I’d ordered the special once before and been content, but prior to Saturday, Cup and Saucer was perhaps the last vegan-friendly place I’d opt to go for breakfast. So thank you, to whoever has brought it pleasantly back into the fold. I wanted to double check and make sure that the soy cheese Cup and Saucer uses in their scrambles is actually vegan…do you know for sure? I haven’t been in quite a while and haven’t seen soy cheese on their menu. If it’s not marked “vegan”, I would ask the staff. The Stumptown Vegans will ask next time we go as well.